The app can be used for finding your nearest hand car wash and getting information on opening hours and prices. You can use the app to pre-book a service at a site so that you beat the queues. You can pay for a hand car wash service through the app (you don’t have to pre-book to do this) and you can earn loyalty rewards and Clubcard points (at selected sites) through the app. Our Franchise Partners run a number of promotions across their sites on a local or national basis. Because the sites are operated by Franchise Partners, the discounts and promotions available do vary on a site by site basis and you should speak to an operator at your local Waves car wash for clarification. Waves reserves the right to withdraw any promotion or loyalty scheme at any time and without notice. Most of our car washes operate a loyalty scheme whereby customers are rewarded for repeatedly visiting the same site. 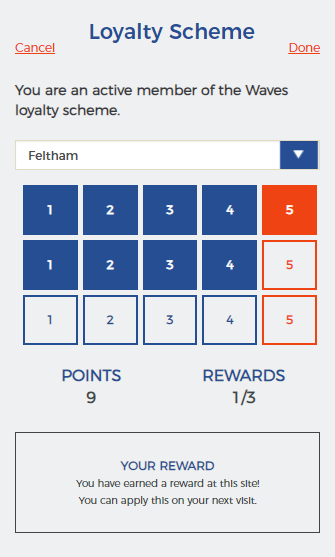 Loyalty schemes vary across our network because the Franchise Partner selects the options they would like – rewards will usually be applied after 5 or 6 visits and the rewards include £5 off a service, a free Bronze, £10 off Platinum or most frequent service free. Our Waves Franchise Partners can run periodic discounts through the Tesco tills both in store and in the petrol filling stations. The Franchise Partners choose from a range of discounts: £5 off Gold, £5 off Platinum and £10 off Platinum. While the promotion is running, simply spend £30 or more in selected Tesco stores or petrol filling stations and receive a discount coupon from the tills; the coupon will be valid for two weeks from date of issue and can be used at the hand car wash in the car park of the store or petrol filling station you visited. 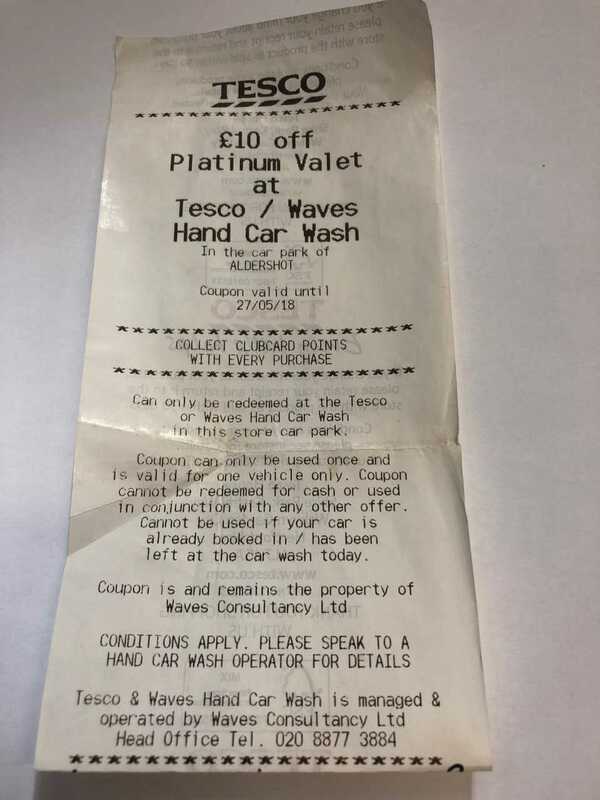 Defence Discount Service and Blue Light card holders can enjoy £5 off Gold or Platinum Valets at selected Waves car wash sites, Monday – Wednesday. Find current promotions near you! This service is for the time-limited and incorporates the Bronze exterior wash with a vacuum of the carpets, upholstery and boot. The Platinum valet includes the application of a Radiant Wax Polish which restores and protects your car. The Platinum valet also includes fine detailing to the interior and exterior of your car including conditioning of the exterior plastics and bumpers. We finish your car off by offering an air freshener hanger.